This is a great set of toy blocks for baby or toddlers. These blocks are soft enough to squeeze and squeak while sturdy enough to stack. The 10 colorful blocks have cute pictures of animals and numbers on each block. 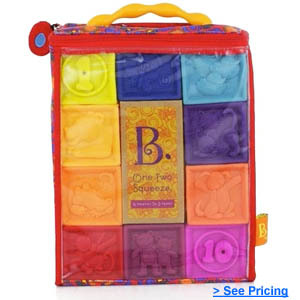 BPA free and safe for baby to chew on when teething. Blocks are great for early imaginative play and these serve as a simple early educational toy as well with colors and numbers 1 through 10.